We’re extremely proud to launch our new menu of experiences for secondary school students. Just like any good team we’re always training, always listening and always looking for ways to be the best we can be. These new experiences are the result of feedback from both teachers and students, and we’ve learned what you really want from your school tours. 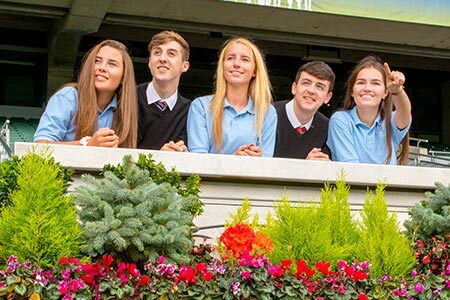 We know your time is precious and we hope our new programme will offer an educational, fun and worthwhile day out at Croke Park for Junior Cert Cycle, Leaving Cert Cycle and Transition Year students alike. We look forward to seeing you pitchside very soon. 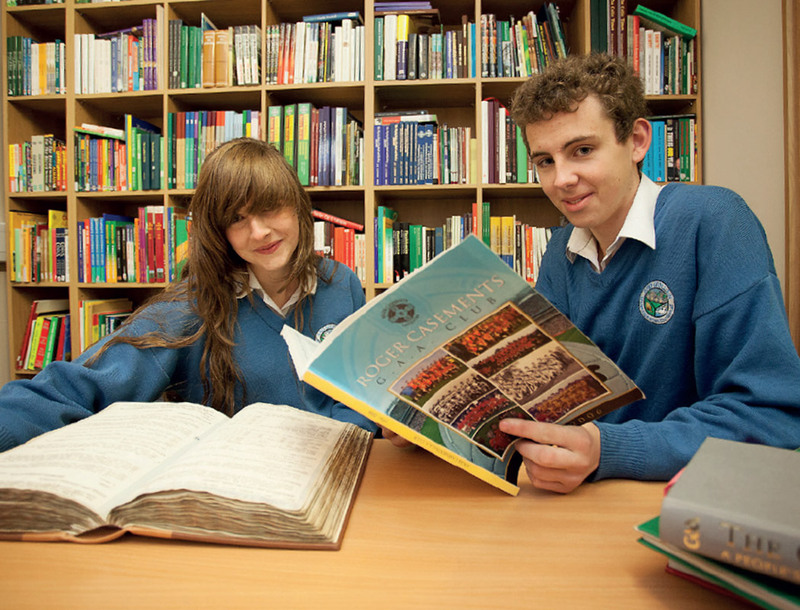 This experience is designed especially for students studying History for the Leaving Certificate. Make of most of your day out by making two bookings in one, combining our Croke Park Stadium Tour with the nearby Butlers Chocolate Experience. See all that Croke Park has to offer in our specially designed ‘Skydium’ experience that combines highlights from our popular Croke Park Tour and our thrilling Ericsson Skyline Tour. The GAA Museum is celebrating its 20th anniversary in 2018. As part of the special anniversary programme, we’re inviting secondary school students to show off their writing prowess with an essay, short story or poem with the theme ‘The GAA is at the heart of who we are’. Time to get out of the classroom and into the stadium! A screening of our ‘September Days’ film to introduce this world-class stadium. A whistle-stop tour of Croke Park which includes a visit to the dressing rooms, walking pitchside through the players’ tunnel and taking a seat in our VIP section. The dressing room visit will pump up motivation levels with a special ‘Get in the Zone’ video message from a GAA legend. An introduction to healthy eating for both physical and academic performance, put together by the GAA’s Community and Health team. Practical advice to support healthy eating not just for sport, but for the game of life. You can keep up the food goals with our 'Recipes for Success' book, which is free to take away for all TY teachers. The Recipes for Success Programme has been developed by the GAA and the Home Economics Department at St. Angela’s College Sligo and the ATHEA (Association of Teachers for Home Economics). Students work in relay teams to complete a physical challenge. To increase the stakes, there’s a mini Sam or Liam to be won! Time for some TY creativity! Students are asked to put together all the information they’ve learned about exercise and nutrition and come up with a hashtag that encourages a healthy lifestyle. They’ll work in teams, keeping in mind that health includes physical, social and emotional wellbeing. The class will then vote on the best hashtag and a class photo showing off the winning hashtag will be shared on Croke Park social media. #famous! Please ensure that all students wear clothing and footwear suitable for physical exercise. We begin with the ultimate scene setter – a screening of our specially commissioned National Awakenings film, which charts the birth of the GAA at a time of cultural revival in Ireland. The film examines the links between the GAA and the Irish struggle for independence and explains how GAA members became entwined in this turbulent period of Irish history. 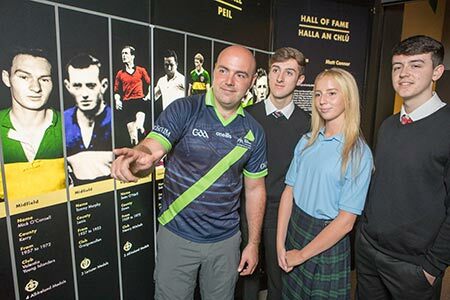 This is a fascinating, in-depth tour of the GAA Museum, where your tour guide will point out exhibits and artefacts linked to prominent historical figures that are key to the Leaving Certificate syllabus. Highlights include a match ticket from Bloody Sunday 1920 and a minute book from the Geraldines Athletics Club in London, where Michael Collins served as treasurer and secretary. Here students will get under the skin of Croke Park, visiting the dressing rooms and warm-up area before experiencing the thrill of walking pitchside through the players’ tunnel. Your class will take a seat in the Ard Comhairle (our VIP section) to learn more about the history of the GAA and the role the Association played in the development of modern Ireland. They’ll also hear about events surrounding Bloody Sunday 1920 and learn of prominent GAA personalities including Michael Cusack, Maurice Davin and Archbishop Croke. 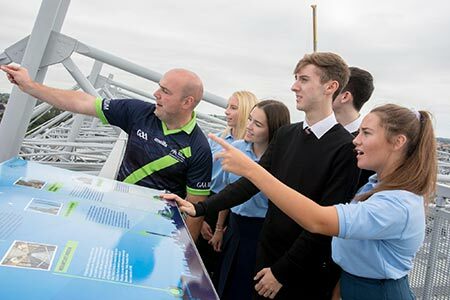 From a look back to a look down – students will get to take a break from the history and enjoy a birds’ eye view of the famous pitch from the Mícheál O’Hehir Media Centre. They’ll hear all about stadium life on match day, when up to 82,000 fans make their way to the home of Gaelic games. 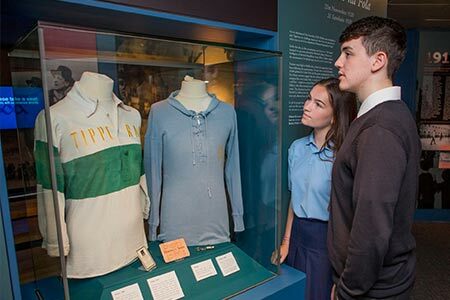 The GAA regularly features in Leaving Certificate exam questions, and this tour experience brings the history curriculum to life for students. Provides inspiration for Leaving Certificate History Research Topics. Education Pack for every student is included in the price. Cost is €10 per student (with minimum of 15 students). Coming Easter 2019! Free event to discover the treasures hidden within the GAA Museum Archives. This is the perfect opportunity for those beginning the Leaving Certificate Cycle to hear Research Topic suggestions from our museum staff, as well as listening to talks from prominent academics and historians. Watch this space! Croke Park’s rooftop walkway is Dublin’s highest open-viewing platform and offers breath-taking panoramic views of our vibrant capital from the mountains to the sea. Our Tour Guides will treat your students to a Dublin City Tour like no other, giving them an insight into its heartfelt history. If students really want to make the most of this 17-storey high, they should download our new Ericsson Skyline Augmented Reality app for free in advance of the trip. They can use the app to see some of Dublin’s landmarks in a new way! Ranked as one of the best things to do in Dublin, your students will thank you for this backstage pass. They’ll get to take a seat in the VIP area, sneak a peek inside the dressing rooms and even walk in the footsteps of Gaelic legends as they go pitchside through the players’ tunnel! Your tour includes a screening of our ‘September Days’ film, which captures the magic of All-Ireland Final Day. To round off a memorable day at the GAA HQ, time in the GAA Museum and our interactive games zone is also included. Duration is approximately 2.5 hours. Cost is €19.50 per student (this covers both tours). Make the most of your day out by making two bookings in one, combining our Croke Park Stadium Tour with the nearby Butlers Chocolate Experience. Your students will enjoy insights into the importance of sustainability across sport and business, not to mention a chocolate or two! Before getting the inside track on sustainability, your crew will get the inside track on Croke Park itself. This includes a dressing room visit, the thrill of walking pitchside through the players’ tunnel and a visit to the media centre, which offers the most spectacular view of the pitch. Perfect for media moguls in the making! Then it’s time to get serious with a talk on Croke Park’s sustainability ability, and why it matters. For example, did you know that since 2014, Croke Park has maintained a major sustainability milestone with 0% of the stadium’s waste generated going to landfill? Croke Park was also the very first stadium in the world to obtain ISO’s newest international Environmental Standard certification. Your class will also get to experience our heart and soul – the GAA Museum. Here they’ll be immersed in the spine-tingling and completely unique story of Gaelic games from ancient times to present day. They’ll see the original Sam Maguire and Liam MacCarthy Cups, before testing their hurling and Gaelic football skills in our Interactive Games Zone! You won’t need to do much convincing to get students on board for this fun and educational tour, at Butlers Chocolates in Clonshaugh (a short drive from Croke Park). They’ll see what really goes on behind the door of a working chocolate factory and they’ll discover where this amazing chocolate comes from. Plus, they’ll also get to decorate their own chocolate treat to take home. Don’t worry, there are plenty of facts mixed into the fun – your class will learn about the Butlers Chocolates Cocoa Horizons Project, which focuses on empowering women in cocoa growing nations to set up and manage farms. Your guide will also tell the story of Fairtrade coffee and your students will discover how the Butlers Chocolate Factory also has a 0% to landfill policy and operates using solar power. Booking for both tours is made through Butlers Chocolate Experience by emailing [email protected]. Both tours provide students with practical examples of how sustainability projects improve business operations. Both tours have a duration of approximately 2 hours each. You can also contact us by emailing [email protected] or calling 00353 1 819 2374.